Augie Globalog » First few days in Dublin! 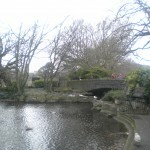 First few days in Dublin! The entire group of us have been here for two full days now, and I think we are all FINALLY adjusting to Ireland time. These first few days have been great– we have spent a majority of the time wandering around Dublin and getting acquainted with the city. My one complaint is that we seem to have brought the windy and snowy Chicago weather with us! Although it rarely snows here, the last two days have been freezing with on-and-off flurries. Thankfully, being from the Midwest and used to such weather, the weather did not prevent us much from exploring the beautiful city. I am so fascinated with the building architecture here. Like the citizens and the culture, there is such an interesting blending of old and new. When we arrived in Dublin on Saturday, the city was preparing for a rugby match against the French. The streets were so crowded with rugby fans and on our way back to the hotel in the afternoon, we walked past a crowd of fans waiting for the Irish players to exit their hotel. Local teens lined the streets flying their team’s flags. The high-energy was infectious, which was nice having slept only a few hours on the plane the previous night. Last night, several of us went to a local pub to listen to some traditional Irish music. It was so fascinating to go to a truly Irish place, instead of a pub made to attract tourists. The pub was bustling with locals chatting and enjoying the great music. Classes start tomorrow and the idea that we are actually here to learn is setting in. Most of us have been starting to work ahead on our readings, and I am thrilled to learn more! It is such an amazing opportunity to be able to learn about the history and culture, while being able to live in it. We are going to the National Museum of Ireland tomorrow and the Natural History Museum on Thursday, so it seems that we have a great week of classes ahead of us! On that note, I need to prepare a little more for tomorrow and get to bed. 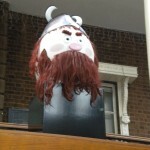 I’ve added a few pictures of some Augie students on a bridge in St. Stephen’s Green Park and of a Viking Egg on display that reminded me of Augie! Cheers!